An umbelliferous species of fens and marshy places, growing up to about 18 inches in height. It is found mainly in the Lecale area, along the Newry Canal, around Lough Neagh and Upper Lough Erne, but rare elsewhere. It has pinnate leaves with sharp teeth around the edges and umbels of white flowers carried on long stalks. 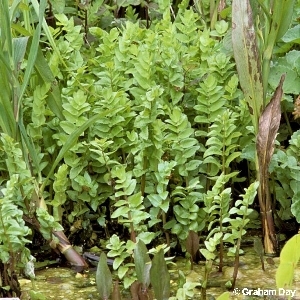 Much less frequent and more local in its distribution than the somewhat similar fool's watercress (Apium nodiflorum) which grows in the same sort of habitat. All names: Berula erecta (Hudson) Cov. ; Sium erectum Huds. ; Sium angustifolium L.